The dedication recalls one of the vanished mediaeval parish churches of Hastings (VCH 9 p27), though that stood on a different site. The new church was consecrated in 1852, designed by F Marrable (B 10 p622) at a cost of £12,000 (PP 125), a sizeable sum for such a church. Marrable may have owed the commission to the presence of his father, a distinguished public servant, on the building committee (1). 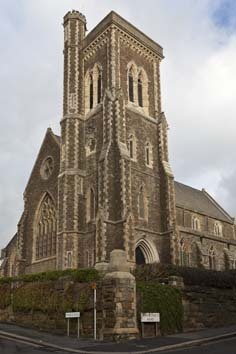 Stone-faced, both inside and out, it has Decorated tracery and arcades. A substantial south west tower was part of the original design but not added until 1872. This lacks the intended spire, but the church makes a handsome composition on its sloping site. The style accorded with the preferences of the more advanced thinking of the day, but other features would have appealed less to such circles, among them the gallery in the tower, opening into the south aisle and nave, and the hammerbeam roof of the chancel in what was widely regarded as the debased Perp style. The boarded nave roof rests on shafts between the clerestory openings with ribs and bosses and contrasts with the hammerbeam roof of the chancel. In 1872 (B 30 p772) a vestry and apsidal organ chamber were added north of the chancel and the east window was replaced by a larger one. 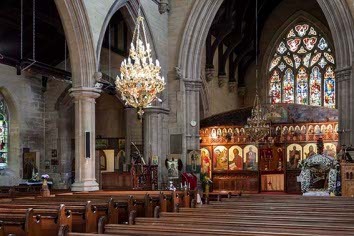 The church became redundant in 1980 and was sold to the local Orthodox community in 1981 for £10,000 (1). 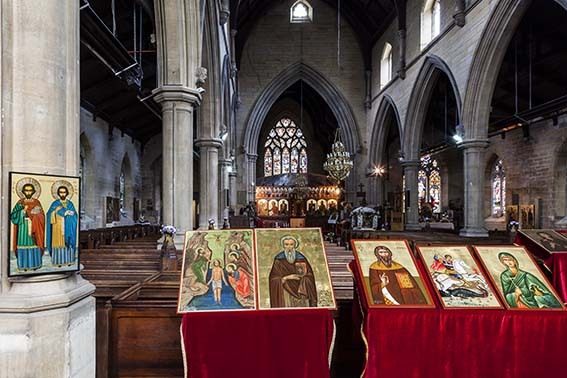 Thereafter there were changes, particularly to the inside, to adapt it to a different liturgy. Chief among these is the iconostasis just inside the chancel arch, which was formed from the previous choir stalls (ibid). Behind this the original sanctuary is at present little used, but most of the fittings still remain, even if not required for the Orthodox liturgy. Font: 1852, presented by the architect (B 10 ibid). 3. 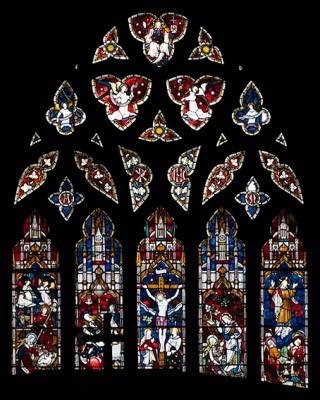 (South aisle, first window) Heaton, Butler and Bayne, 1866 (B 24 p531). 4. 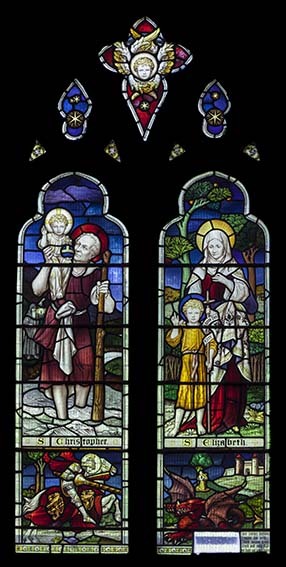 (East window) Clayton and Bell, 1872 (www.stainedglassrecords.org retrieved on 28/3/2013). 5. (South aisle, second and third windows and north aisle, first to fourth windows) Clayton and Bell, 1882-1926 (ibid). 6. (South chapel, east window) Clayton and Bell, 1872 (B 30 ibid). 7. 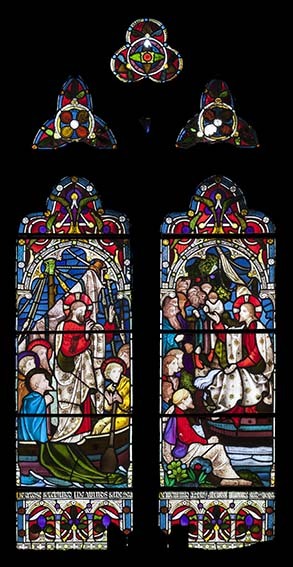 (South chapel, first window) H Hughes, 1872 (signed). 8. 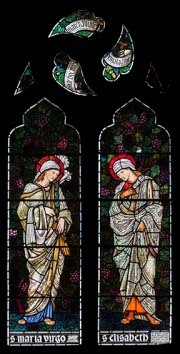 (South aisle, second window) Sir E Burne-Jones, 1881 (Two saints). Pulpit: Stone, 1852 (B 10 ibid). 1. 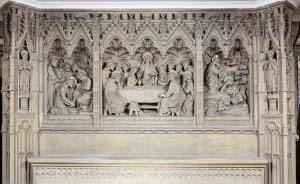 Elaborate carved stone Last Supper, A handsome piece, it was installed in 1872 (B 30 ibid), but the designer is unknown. 2. Wooden and erected in 1919 as a war memorial. The architect was C L R Tudor and the painted figures and shields on it are by P W Cole (both 1). 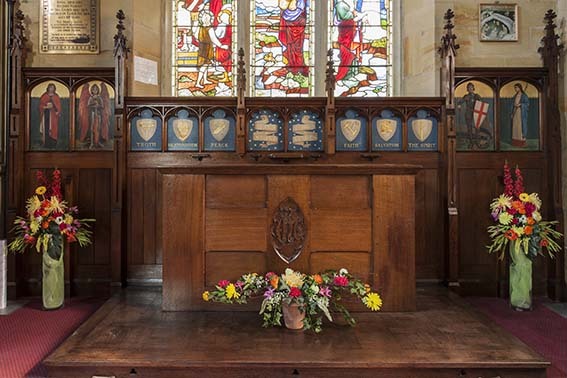 Sedilia and piscina: These were designed by P M Johnston and donated in 1913. They are said to be made of Sussex marble (1). My thanks to Nick Wiseman for the photographs and for alerting me to the appearance of a new guidebook with much interesting information (see 1 above).